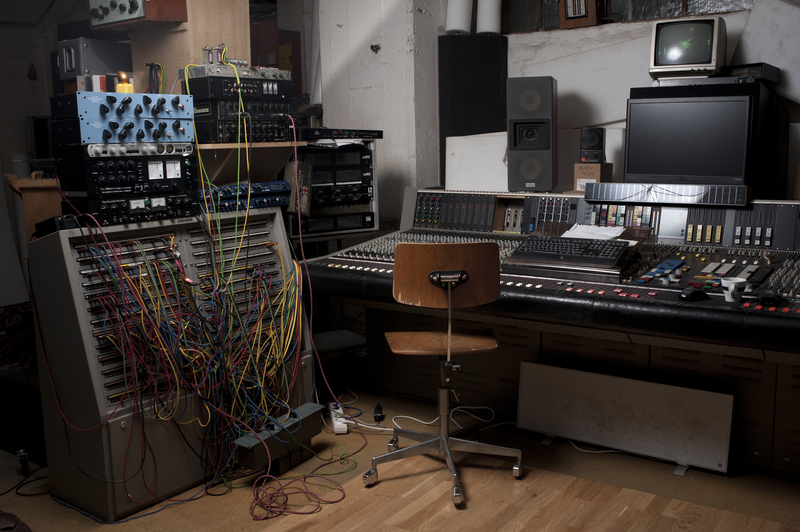 The large(40 m2) control room houses the Siemens C48 mixing desk as well as all of the outboard gear. In a sound proof corner you will find the 16 track Studer tape machine. There is plenty of space for the musicians to listen to playbacks, but there is also an abundance of space to track in the control room. You will also find a comfortable leather sofa, situated at a perfect distance from the monitors. The studio(19m2) was designed and engineered for a big and transparent sound. With it’s daylight and cozy atmosphere, it is the perfect spot for recording bands of all sizes. The room also has no parallel surfaces, and a good amount diffusers and sound absorbers. The diffusers make the room sounds a lot bigger than it is, while the absorbers are tuned to absorb the low-mid frequencies. The results are clear – a well balanced sound in the room microphones, while the room is still able to offer good separation. Studio B(22m2) is optimized for rehearsals. The acoustic is somewhat more direct than in Studio A which allows the musicians to perfectly hear what each other are doing. With studio B being completely isolated from Studio A, it is possible to record even the loudest instruments in one while recording a solo violin track in the other.